I did not believe I could admire this former FLOTUS any more than I already did. And then I read her memoir Becoming. A class act, like the lady herself, Michele Obama’s Becoming is easily one of the finest memoirs I’ve ever read. It’s her story, in her own words, her journey of Becoming, which is equal parts insightful and inspiring. And reflects her delightful personality, her value system, as well as her hopes and dreams for her country, and the people. However just to be clear, this is not a former-FLOTUS-to-the-world kind of memoir, it’s a woman to woman one. Which is possibly why I could relate and identify with her story even though we have absolutely nothing in common on the surface. And the things that truly stood out to me, as she shared her journey in this book, were the things I’ve always admired about this lady. Her strength of character, and her grace in the face of adversity. And boy was it tested on more occasion than one, considering the position she held for close to a decade. That being said, I have to say that this is not a book about Politics. In-fact she categorically states that she hates Politics. Though of-course being FLOTUS for almost a decade means it’s still very much a part of her story. But definitely not the soul of it. At its core, this book is just about a remarkable women sharing her story of Becoming, in a refreshingly honest way. And there is power in that. It’s touching & inspiring, all at the same time. Oh and this is also a memoir that is courageous enough to go Everywhere!! But without ever betraying her motto of ‘When they go low, we go high’. And that, in my opinion, is just so HER. Strong, Ambitious, Determined, Courageous, all while being Grace Personified. 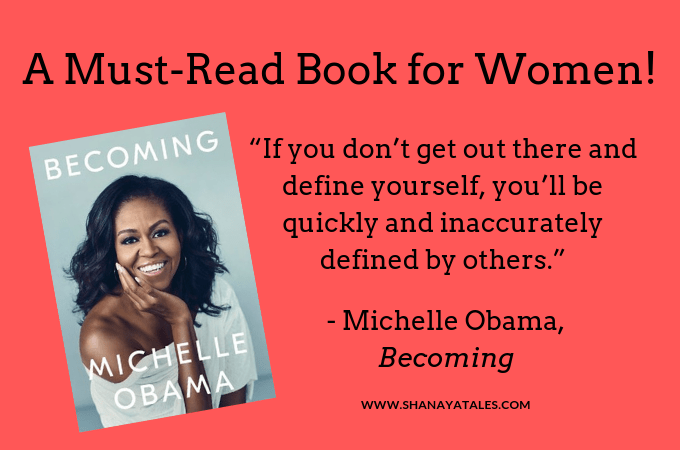 The Becoming Audiobook is read by Michelle herself, and so it’s one I HIGHLY RECOMMEND. To hear her story, in her own words, and her own voice, was an incredible experience, and one I’d recommend to EVERYONE. But honestly, even if you haven’t ever heard an audiobook, START WITH THIS ONE. Don’t worry about not being able to focus or keep up. It will be just like listening to another remarkable woman sharing her story. And I promise, once you start, you’ll be hooked. What’s even better is, especially if you are new to Audiobooks, you can get this one for FREE via Audible Free Trial. Yes, you read that right. One of the most popular books of the decade for FREE. Also, depending on your location, currently Audible is offering 2 FREE Audiobooks instead of One, as a part of their FREE TRIAL. So don’t overthink it, get this now, and thank me later! Because honestly, if you are going to try audiobooks, Audible is the best possible place to start (not to mention this is the best possible book to start with). They have the most well produced audiobooks in the market, and so you’d get a glimpse of the very best there is. Click THIS LINK, or the banner below to check out the Free Trial Deal in Your Location. There is a quote by Brandon Sanderson – “The purpose of a storyteller is not to tell you how to think, but to give you questions to think upon.” And this is one book that does just that. It’s a captivating, compelling, & all around exceptional memoir, by an all around exception woman, that makes you think, and hope, and not settle for the world as it is, but inspires you to work for world as it should be. One book that must definitely be in everyone’s collection! That’s all from my end, folks. I’d love to hear from you. Did you read this book yet? If not, go pick it up NOW! Preferably the Audiobook. But if you did, tell me did you love it as much as I did? I think you did. Because, let’s face it, what’s not to love? Oh wait, maybe one thing. The fact that she announced she hates Politics, and because of which she doesn’t ever want to be POTUS. This is especially heart-breaking after reading a book full of reasons why she is uniquely suited for that role. Sigh. But you know what, in this particular case, I am choosing to live in denial, and clinging to the hope that she herself inspired. So I will hope (and pray) for a world (and role of POTUS ) as it should be, while ignoring the disaster it is. P.S. In last month’s Bookmarked (my FREE monthly newsletter, which is full of bookish news, views, resources & reviews) I shared that Michelle Obama is soon going to feature in a YouTube Original called BookTube. If you did not get a chance to catch it, here is the link to view it (and this is the extended version). .. Imagine how incredible it’s going to be. I don’t think audible is offering two free ebooks in Australia. Will have to check what other offers they have. Yes, Australia is always the odd ball with Amazon. But they should be having some offer. At-least one? Here in US they are offering 2 free audiobooks, and then some Audible originals too. Oh and yes, Michelle O as POTUS is a dream I have held on to for long. Even though she dismissed the possibility in this book, she is the one Madam President I can get behind. In the meanwhile, I hope we have good alternatives for the upcoming elections. Michelle Obama is an enigma. I would love to know her story in her own words. I tried to click on your free link for the audiobook but I don’t know why I have been charged a minimum fee on my credit card. Though, thanks for sharing. I hope to listen to her soon. Vinodini recently posted…When Does a Diet Regimen Turn into an Eating Disorder? That’s odd. They do need credit card info, but they shouldn’t charge anything. Maybe in India they do, and then reiumburse? Either way email Amazon. They should have it sorted. Because I know some of my friends in India have been able to get this one for free through Audible Free Trial. I have been seeing this one everywhere and I am intrigued. With such high praises from you I might be persuaded to get this one as well. I’ve heard good things about her book. Will have to add it to the list that continues to grow. I get the feeling this will be a Kindle read so I can highlight things that speak to me. You already know I absolutely loved the book. I’ve been stalking her on You tube ever since I finished it. Like you said it is a woman to woman memoir and ever so relatable. It makes you believe that anything is possible. Let me check if I get it on audible. I’ve heard rave reviews of the audio books from more than one person. Watching her on the Ellen show talking about it makes me want to hear it in her voice. Oh good you mention it. I had forgotten about. But I gotta check out her Ellen show! You already know I loved the book, I’ve said so on every possible platform. I’ve been stalking her on Youtube ever since watching all her book promotions. After I saw her on Ellen I want to listen to the audible version. Since she has narrated it herself I know it will be a treat. Thanks for sharing the link to the Booktube video, enjoyed it. Yes, I have been stalking her in most places too. Youtube, Regular TV, Social Media, you name it! Your adulation and praise is infectious Shaan; I am not much into following public figures regardless of who they are or what they are doing. But your review has convinced me to check out the Audible deal; I think hearing the book in her voice should truly do the trick of making it believable and worthy of a read.